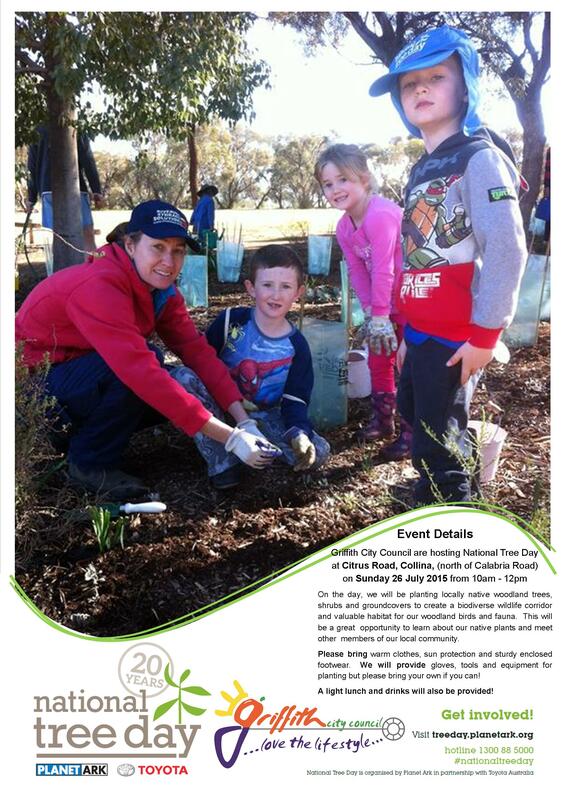 Griffith's National Tree Day Event will be held Sunday 26 July 2015 from 10am - 12:30pm. This year, Council will be facilitating the planting a wildlife corridor on Citrus Road, Collina. Almost 1000 locally native plants will be planted during the week of National Tree Day, along an 800m length of Citrus Road, north-east of the Calabria Road intersection. As Collina further developments, the corridor will be extended, eventually linking the site to Rifle Range Road and the McPherson Range. All plants selected for the site are local natives, typical of the Bimble Box/ White Cypress Pine Woodland Community. These species represent those which would have been present at the site prior to the development of Griffith and are therefore adapted to our region. The corridor will provide habitat for native fauna to utilise and move throughout the landscape. These plants will be connected to a drip irrigation system for the first 2-3 years and once established will survive on our natural rainfall. A printable flier can be downloaded below.